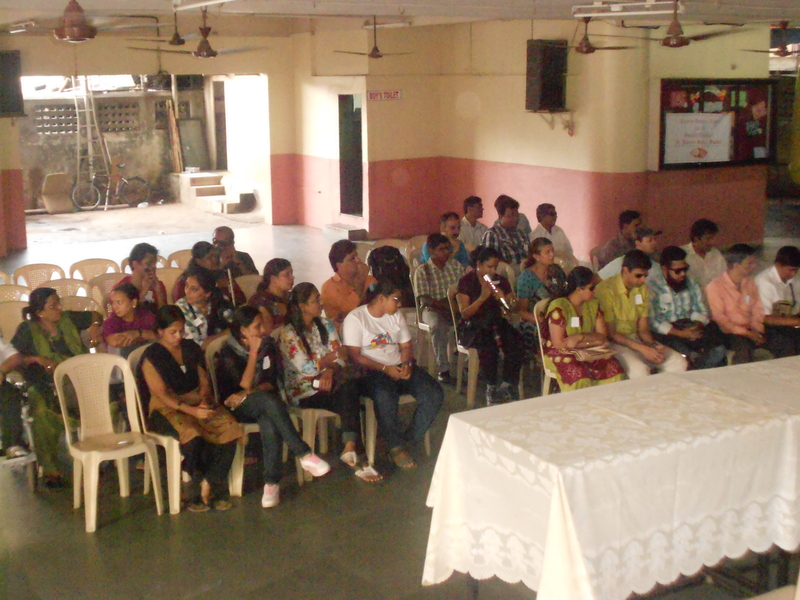 Voice Vision organized a one and half day workshop on accessible technology, “Reading Without Seeing”, in association with the Xavier’s Resource Centre for the Visually Challenged, (XRCVC), & Technical training Institute for the blind (TTI), sponsored by Sight Savers, under Mumbai Eye Care program on Saturday 27th October and Sunday, 28th October 2012 at Dr. Radhakrishnan Vidhyalaya, Mumbai. The “Reading Without Seeing” seminar is an awareness and basic training of accessible technologies for the blind being run as part of a nationwide program under the DAISY Forum of India (DFI). The seminar was a demonstration of different mobile accessible technologies along with various reading equipments, DAISY book players and magnifiers, Braille writing devices & low vision aids made available by XRCVC. Day one of the workshop, Saturday 27th October, focused on “Mobile Accessibility”. The participants received training in the usage of mobile screen reading software’s for three different platforms, I.E, Symbian, Android and IPhone. The seminar started with an inauguration and brief introduction made by Ms. Rupa Mukherjee followed by an overview of the workshop and an introduction of the participating organizations, XRCVC, & TTI done by Mr. Rajesh Mehta. After a brief introduction of all the participants the “Mobile Accessibility” workshop was flagged off by Dr. Homiar, [CEO TTI Pune], who highlighted the basic settings of the Talks (screen reading software) for symbian phones. Then, Mr. Haresh Kotian, Moderator of the AccessIndia mailing list, gave the participants an overview of the apps on the symbian phones like quick office, calculator, Dictionary, daisy2go, etc. This was followed by a session on Android mobiles conducted by Mr. Chetan Penkar, from Smartshehar.com, who highlighted the basic usage and various apps like GPS for android phones and gave information about the various screen readers available for android. The final session of the day was about the IPhone, where Ms. Nidhi Goyal, gender & disability rights activist, gave the participants information and demonstration of the accessibility of the IPhone. The day’s activities were brought to an end with the felicitation of all the trainers by Ms. Sushmeetha Bubna, Founder Director, Voice Vision. Day two, 28th October, the “reading without seeing seminar” began at 9:30 am. The day’s activities were flagged off by Mr. Sameer Latey (volunteer with Voice Vision) who opened the floor for Dr. Homiyar, CEO, and TTI. Dr. Homiyar demonstrated the usage of books in various formats, such as Audio, DAISY books, E-books, etc. he also gave information about the different computer screen readers available today and their uses. Ms. Calvena, XRCVC, gave information on Accessible OCR systems, Braille note takers, Refreshable Braille displays, etc. Mrs. Hetal Mehta (volunteer with XRCVC, gave a detailed explanation on Optical low vision aids like, illuminated magnifiers, hand-held magnifiers, telescopic distance reading device, Electronic video magnifiers, etc. She also theoretically explained the usage of accessible tools of daily living which were practically demonstrated later in the experience zone such as, talking BP monitors, personal weighing scale, talking calculator, pen friend, etc. Information of online libraries, DFI, and websites from where DAISY books could be obtained like bookshare, Inclusive Planet and Online Braille Library (OBL) was provided by Mr. Susheel from XRCVC. Mr. Rajesh Mehta, volunteer with XRCVC, demonstrated the usage of mobile dictionary & GPS systems, and highlighted the various benefits of these applications. After the lunch break it was time for the “Experience Zone”, where detailed explanations alongside hands-on demonstrations were offered to the participants, on features of the various accessible equipments and infrastructure facilities. They were given an opportunity to touch & feel each of the products discussed during the day. The workshop concluded by 5:00 pm after the Vote of thanks delivered by Ms. Sushmeetha B. Bubna, founder director, Voice Vision. We thank our co-organizers and facilitators, XRCVC & TTI for bringing the Reading without seeing seminar to Mumbai and giving us information of all the technologies available for us today. We thank all of the trainers namely, Dr. Homiyar Mobedji, Mr. Rajesh Mehta, Mrs. Hetal Shah, Mr. Sushil, Ms. Calveena, Mr. Haresh Kotian, Mr. Chetan Penkar & Ms. Nidhi Goyal for conducting the workshop and providing the necessary information to the participants. We also thank the authorities of Dr. Radhakrishnan Vidhyalaya for providing us the venue and the canteen for the delicious refreshments served. We specially thank the volunteers from Bhavans college, Andheri, Mumbai, and Ascent Networks pvt ltd for always being on their feet and helping us. A big thanks to our Voice Vision committee for constantly coming up with new ideas and supporting us. And last but not least, we thank all of our participants who comprised of people of diverse age groups from all over Mumbai and other places like, Pune, Gujarat, and Chennai. All of them learnt something new from the workshop and were left with a sense of empowerment with the knowledge gained about all the technologies that were on display.